City Girl, Country Home: Don’t Miss a Thing this Christmas! I’m back in the urban city for the holidays. Just had a nice, morning walk at the village park. I always enjoy these times of exercise because these are also times when I spend time praying and reflecting. I couldn’t help but notice and thank God for the various trees lining the sidewalk. I think I have a favorite one now (I don’t even know what kind of tree it is); it’s this certain one that has a massive trunk and branches stretching out in such artistry. When I look up, its branches and leaves cover such a wide area; simply beautiful! Yesterday morning, while still at the countryside and at about the same time, I had just come home from Mass and was enjoying the cool December breeze. Then, while I was standing at my backyard facing the fields, a flock of white birds began gliding through the air. I ran to take a closer look; simply beautiful! God’s touch is all around. Nature takes no effort in displaying His glory, for that’s what it was made for. This comes only by spending time with Him. For me, this is what makes Christmas most special — spending time with the Birthday Celebrant, asking Him what He wants for His birthday, allowing Him to refresh my spirit. I have a favorite spot in my country home. It’s a sofa in the living room. It’s the place where I pray most times, because when I sit there, I can easily see our altar. And it’s there where I get to “hear” Him speak to me, in my heart. Of course, I sense His presence in so many other places and hear Him speak in so many ways. Just like now. I’m now seated on another sofa, in a smaller living room, surrounded by beautiful floral arrangements (my mom’s biz, actually). And yet, when I read today’s Mass readings, whoa! God’s Word became so alive! For instance, today’s response: “The Lord has done great things for us; we are filled with joy” (Psalm 126:3). I can only agree! 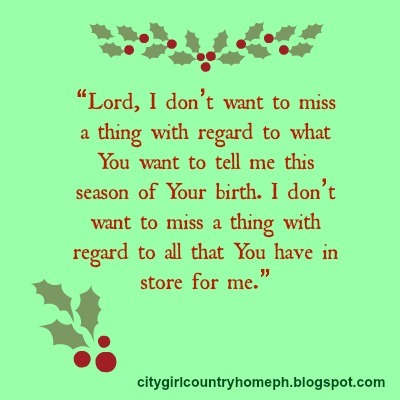 So to me, Christmas wouldn’t be Christmas if I didn’t spend time with the Celebrant. This is what makes all the difference for me. Try it out, and see how much deeper and more meaningful your Christmas will be!